Start your four-hour tour with a wander around the southern end of New York’s world-famous Central Park. From there stroll along Sixth Avenue to West 53rd Street where the Museum of Modern Art (MoMA) comes into sight. The impressive eight-storey structure contains more than 150,000 pieces of modern art, along with 22,000 films and 4 million film stills. From sophisticated masterpieces by Picasso to the old-school computer game “Street Fighter”, there’s guaranteed to be something for everyone. Backtrack slightly towards Seventh Avenue, then down to West 47th Street and you’ll arrive at one of the world’s most famous scenes – the major commercial intersection of Times Square. 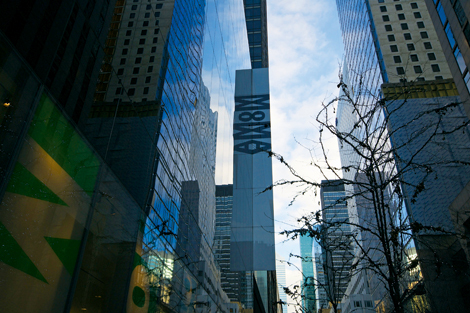 Stretching between West 42nd to West 47th, the crowded area is colourfully adorned with massive billboards and advertisements. It is impossible not to be impressed by this entertainment power district, which has become an instantly recognisable icon of New York City. Be on the lookout for Duffy Square (between 45th and 47th), home of the TKTS booth selling discounted tickets for Broadway and Off-Broadway shows, and One Times Square – the site of the annual New Year’s Eve “ball drop” celebration. Other noteworthy sights include the famous Coca-Cola sign, and the “Naked Cowboy” street musician (real name Robert John Burck) who occasionally performs with his strategically placed guitar. Continue down Seventh Avenue before turning left on 42nd Street, past Madison Avenue, and you’ll find Grand Central Terminal. An architectural marvel, the station is praised for its meticulous design details such as the ornate vaulted ceiling above the Main Concourse. The terminal houses 67 tracks and is a designated station for five Metro-North rail services – Harlem Line, Hudson Line, New Haven Line, New Canaan Branch and the Danbury Branch, providing access to the whole tri-state area. However, the appeal of Grand Central Terminal extends beyond the connectivity benefits. The Dining Concourse, located below the Main Concourse, is filled with a huge choice of restaurants including the Oyster Bar, which has been around since the terminal first opened in 1913 and remains the station’s oldest business to date. Other notable points of interest within the building include an annex of the New York Transit Museum, and the Grand Central Market, which provides an array of gourmet and fresh food produce. Head back to Fifth Avenue, then turn left to West 32nd Street. Get your camera ready for a few obligatory snaps of the Empire State Building as you pass it, before turning right onto 32nd Street to reach your destination, the 1250 Broadway building. Located on the penthouse floor is Korean restaurant Gaonnuri, which translates to “centre of the world”. 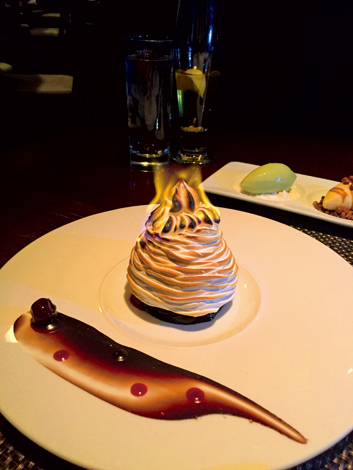 The 2015 Michelin-recommended restaurant boasts some of the best views of Manhattan’s iconic skyline and the Empire State Building, while serving traditional fare such as bulgogi (thinly sliced prime beef ribeye marinated in spicy sauce), seng galbi (unseasoned prime beef short ribs) and yuk gae jang (spicy beef soup with scallions, mushroom and glass noodles). In addition to individual menus for both lunch and dinner, Gaonnuri offers a tasting menu that changes seasonally. For those who prefer a quick bite, consider heading to the bar for a tasty selection of light appetisers and drinks. 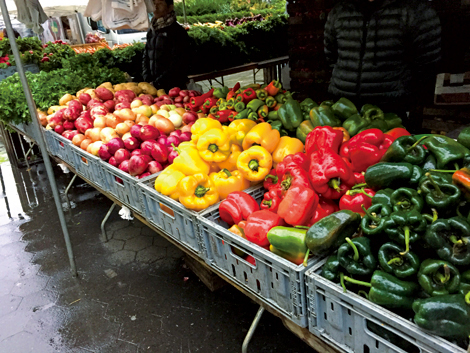 The Union Square Greenmarket is a must for foodies. During the summer, the market attracts around 140 regional farmers who sell some of the freshest produce you’ll find in the city. The Greenmarket also attracts many of New York’s hottest local chefs, who often showcase their skills through cooking demonstrations. The bustling market opens on Mondays, Wednesdays, Fridays, and Saturdays between 8am and 6pm. To get there, hop in a taxi and ask for Union Square Park. The journey will take about five minutes and cost about $US7. Alternatively, head to the subway via the nearby Herald Square station and take the “N”, “Q” or “R” service to Union Square station. A one-way trip will cost US$2.25. For the last leg of your excursion, take a gentle and picturesque six-minute walk through Union Square Park until you reach the corner of East 12th Street and Broadway. 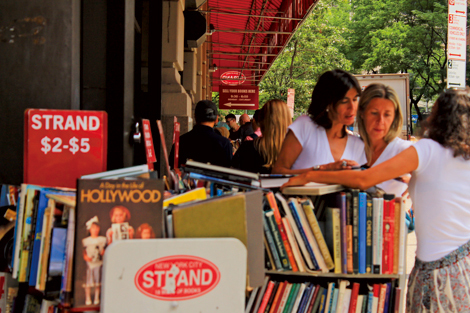 Here you’ll find one of New York’s oldest bookshops, Strand – renowned for its huge selection (some 2.5 million) of used, new and rare books, hence the company’s “18 Miles of Books” slogan. Check the website in advance to see if you can time your visit with one of the store’s regular events featuring high-profile literary names such as Junot Diaz and Hilton Als or celebrities like actor James Franco.